Thrusting up 200m from the plain like an isolated dental molar, Sigiriya Rock (map) is the fortress-palace of King Kasyapa (or Kassapa; 473 - 491 AD). Kasyapa usurped the throne in 473 AD, killing his father Dhatusena (455 - 473) and driving his half-brother Mogallana into exile in Tamil Nadu. During his brief reign as King Of The Mountain, Kasyapa fortified and beautified the inselberg with pools, paintings, and gardens that men compared to the abode of Kubera, God Of Wealth. The site's advantages did not save the king, however, who was killed in battle by Mogallana in 491. The photo on this page shows the west face of the rock, viewed from the Water Gardens. 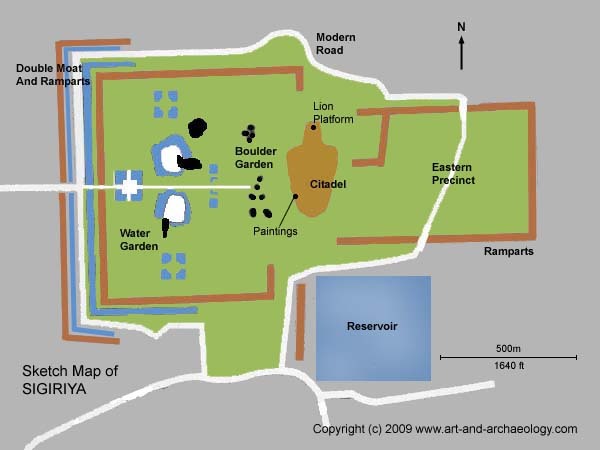 In the following pages, we first tour the grounds of the site, then climb up to see the Mirror Wall, Apsaras Paintings, and Lion Platform. We finish at the top of the rock, with views of Kasyapa's Palace.